Looking for the easiest way to make professional animated videos for your company/product? Great! That’s exactly what we’ll teach you in our GoAnimate review below. Gone are the days when making a high quality animated video for your brand was a hard task that involved prohibitive costs. You had to spend a lot of cash on high-end editing suite and spend hours and weeks mastering the software. And at times, you’d resort to hiring an animator. With GoAnimate, everything has become so easy! You can now create top-quality, highly engaging animated videos at incredibly low costs. You only need a reliable internet connection. Such a video instantly increases your ROI, boosts your brand engagement, and even improves the social sharing. In simple terms, GoAnimate is a web-based video application- a powerful one- that lets you create animated videos easily. Besides, it allows you to create whiteboard videos, video infographics, explainer videos, and so on. The app does not require you to have any special skills in animation. You only need to have the basic computer skills, and you’re ready to go. It presents you with a user-friendly, drag-and-drop interface that makes creating professional looking videos a Simple and Fun exercise. The fact that this is a web-based application means that you don’t have to install any application to start using it. You just go straight to your web browser to access it (but keep in mind that you ought to have a strong internet connection. When starting out, this application offers you two main options. You can choose to “Make a Video From Scratch” option or just pick from a range of the templates that will guide you through the entire video creation process. I’ll advise you to build your video from scratch if possible. This will let you choose various styles for your video- some of which are business related. Numerous groups of individuals can employ this online video tool to meet their video creation and editing needs. Anyone who wants to make an animated video can use the tool- irrespective of their artistic skills. Teachers, as well as instructors, will find GoAnimate a valuable asset for easily creating compelling instructional animated videos for their students. If you own a company, you can make effective advertising videos within a few minutes and enjoy increased. Sales of your product, more site visitors, boost engagement, and so much more. Ordinary people too can create eye-catching resumes with this online video animator. Have an upcoming business presentation? Well, use GoAnimate to come up with great infographics with attention grabbing qualities such as colors, moving graphs, etc. GoAnimate is Real Easy to Use: GoAnimate is incredibly easy to use, unlike other video editing tools out there. You just need to produce the storyline and the tool does the rest. All that is required of you are simple clicks and drags, and you’ll end up with professional looking videos. The application’s user-friendly interface features three major sections namely the stage, the timeline, and the asset sections. -The Stage is where you manipulate all you actors as well as props. -The Timeline contains the audio and video tracks as well as all your video scenes. -The Asset is the area holding all your backgrounds, characters, props and other assets (including their functions). This organization makes animating scene elements 100% intuitive and easy. To add a more intuitive feel to the application, the video tool developers decided to dispense with traditional keyframe animations method- which is hard to master and use. Instead, they opted for the method based on individual scenes. Cost-Effective: What’s more expensive? Hiring an animator or using GoAnimate to create your product videos? Of course, hiring a professional video editor will cost you a lot of cash. But using this online application to create your videos will mean less cost since its highly affordable (as you’ll discover later in this post. What’s more, this video animation tool can produce even better videos than most animators out there, and you get to customize to meet your specific needs. So, be wise. Go for GoAnimate! A Huge Library of Characters! : Another great feature you’re not likely to enjoy in other video animator tools out there. GoAnimate provides you with a pretty massive flow of different characters, not forgetting the settings that allow you fit each character to your storyline. What’s more, the app lets you create your own characters with a few clicks only. Ability to Fully Customize Your Videos: You want an animated video that matches your expectations and meets your specific goals, right? This video animator lets you produce such a video by letting you manipulate the settings offered. You can change the template settings as well to portray different scenes from offices to outdoors. You can also successfully modify the expressions and poses of the characters in your video. For instance, you can make them look happy, mad, sad, excited, and so on. Don’t forget that the application also offers you a large section of items that you can add to your video- like phones, furniture, cars, plants, clocks, and others. Best of all, you’re presented with a variety of media (video and audio effect and enhancements) options to help you create a video that meets all your needs. Ability To Import: Another reason why you should count on GoAnimate to produce great animated videos! The site lets you easily import media for use to create your video. You’ll have a fun time importing music, images, video clips, and screen captures. I’ve extensively relied on this excellent import feature when creating my videos. I usually record the voice-over files separately, so I have to import it to the application. Plus I’m also able to import simple animations and shapes that I’ve created earlier with Adobe Flash. If you combine these with the great features offered by this online tool, you’ll end up with high-quality animated videos. Automatic Lip Sync: Yes, you heard it right. With GoAnimate, you can give a voice to any of your characters and they’ll automatically lip-sync it. Just provide your voice track to the background and it will become a voiceover narration. As you know, matching the dialogue to your characters’ mouths will create an extreme illusion of speech. This will make your videos look more authentic- one of the qualities of animations that go viral! Did you know that manual lip-synching will consume long hours of tedious labour to ensure that you make correct adjustments to almost all the frames even for the short animations? Luckily, lip-syncing is an automated task with GoAnimate- smile! First things first: GoAnimate offers you a 14-day free trial where you enjoy all the features in the GoPremium plan (discussed below). All the videos you animate during this period are watermarked. You can share them but not download or export them. No credit card information is needed to join the free trial. 1. GoPublish Plan: This is the primary GoAnimate package. For only $39/month or $299/year, one user will enjoy up to 720p High Definition download or export resolution. You’re also allowed to create an unlimited number of videos which you can easily export to all video sharing sites such as YouTube. There’s unlimited hosting/playback, unlimited exports/downloads, ability to import flash and images, and access to all the GoAnimate features and library. 2. 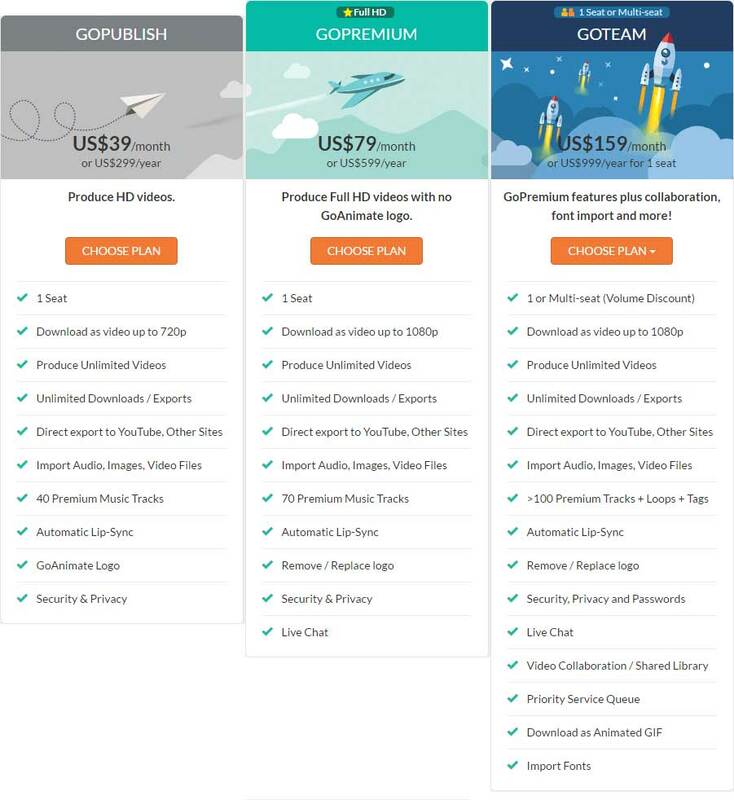 GoPremium Plan: This is the mid-level GoAnimate package that comes at a slightly higher fee of $79/month or $599/year. It lets one user enjoy all the privileges outlined in the basic package above. Additionally, you’ll get a better video resolution here- the Blu-Ray 1080p Full HD level. You’ll also benefit from the right to the export completed videos, add clickable links to your videos, and replace the watermark. 3. GoTeam Plan: this is the last and the ideal package for multiple users. It goes for $250/month or $2000/year for up to 3 users. It comes with all the features in the GoPremium package. Besides, it supports group management and project collaboration. Escalating volume discounts are available for additional users. Click the “Make A Video” button located on the top right corner on the official website. You’ll be presented with two options to pick from: make a video from scratch or use the video templates available. You can also choose the “Character Creator” to come with your own characters. If you’re using the template option, just click left/right to select your preferred scenario- like office meeting, in the break room, interview, etc. Select how you want your characters to appear. Here, you can just from choose the pre-made characters. But if you’re like trying out new things, you can make your own characters. Record the voice for your characters. GoAnimate lets you quickly select the voice for your characters using filters such as different genders, adding emotions, and different languages. The GoAnimate automatic lip-sync makes your video look even more realistic. Eventually, preview your animated video by clicking on the preview button. If you’re satisfied with it, go ahead and publish it. GoAnimate is a powerful tool that many people are using to create top-quality animated videos- particularly the teachers and marketers. It’s a creative path that’s helping folks effectively get their message across. Overall, you’ll be pretty satisfied with its flexibility and ease of use. You don’t to attend any classes to learn how to use; simple tutorial offered by the manufacturer are enough to get you started. If you’re planning to use online videos to promote your blog or business, then GoAnimate is worth a try! Supports different video styles- from explainer videos, video infographics, whiteboard videos, etc. 14-day free trial gives you access to all the GoPremium package features. offers you a wide selection of background music for your videos. No expertise/skills needed to create high-quality animations. You get started ASAP! No software installation is required. Ability to add motions to your character and elements. Allows you to import images, audio, and video files. Affordable pricing- starts at only $39 a month! Cheaper than hiring an animator. The ongoing monthly cost might be too high for new users who are just starting their business and don’t have a reliable income. You’re required to pay an extra fee of $79 per video to transfer commercial rights to a third-party or client. Live Chat- this lets you enjoy real-time support from the GoAnimate staff on any pressing questions or problems related to the app. However, note that this option is not accessible to free trial and basic package (GoPublish plan). Resource Center- here, you’ll get expert advice on how to make highly efficient business videos. Topics covered on this page include video presentations, sales and videos, training and videos, and video marketing. Help Center- if you have any question related to the GoAnimate application, you can quickly type it here and search for quick answers. Under the help centre, you’ll also encounter Knowledgebase. Here, you can access important announcements, release notes, video making tutorials, publishing videos, plans and pricing, technical support, terms of service, and so much more. A well-organized FAQs where you can get quick answers to the commonly asked GoAnimate questions is also available. You can also submit a request via the Contact Us page (however, you might take a little bit longer to get a reply). Note that the company supports three languages: English, Spanish, and Portuguese. That’s it for our goanimate review. As you’ve seen, this online video animator tool is a cleverly thought-out, well designed, and highly useful product for you. It offers you an intuitive user interface that lets you create great animation videos easily and quickly. No installation needed to start using the product. You can fully customize your videos to match your expectations by adjusting different settings on the application, creating characters, and importing images, audios, and videos. The product’s pricing plans are also pocket-friendly. You will get to enjoy the powerful features of this online video tool from as little as $39 a month! If you want to create animated videos without any custom animations, or if you’re on a tight budget, you can give GoAnimate a try by signing up for GoAnimate free account today. We have something exciting to offer you. That is our special 5% goanimate coupon code. If you wish you can use our special coupon.